On-board diagnostics (OBDll) data was once available only to professional mechanics. With the CarChip Pro, this same data is now in your hands. 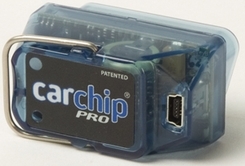 CarChip Pro is an all-in-one engine performance and driving monitor. About the size of a key fob, it's a great way to keep track of your vehicle, and your or others' driving.